Create A Bootable USB Drive With UNetBootin ~ Your Own Linux..! One way to install an operating system on a netbook or a computer that does not have the option to boot from CD / DVD-ROM, is to create a bootable USB drive from the ISO-image of the operating system. Installing OS from USB drive is only possible with the support of its motherboard (most modern motherboards, notebooks and netbooks have this feature). This flash drive will help make computer repairs more quickly and efficiently. 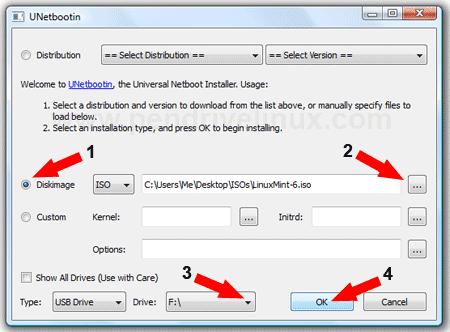 To make a bootable USB flash drive from ISO-image, a cross-platform program that will help you is- UNetBootin, which is a version for Linux, as well as for Windows. This program allows you to boot from any ISO-image can easily make a bootable USB flash drive. In the process of creating a bootable USB drive with UnetBootin, stored data will remain intact. Free hard disk space USB-drive must not be less portability ISO-image. If you want to create a bootable USB flash drive with the operating system Windows, you must use the instruction of creating a bootable USB drive with Windows. 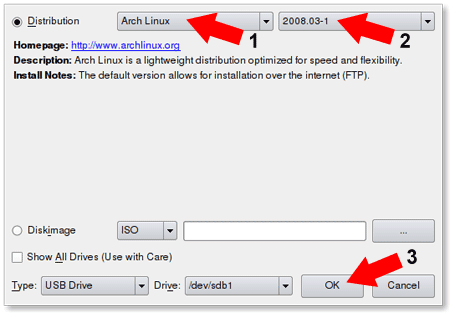 You can either select your OS from the list of distributions available or use your own ISO-image. The program itself will automatically process the ISO-image and make a bootable USB flash drive, with which in the future, you will be able to install the OS on the computer without using a CD / DVD-ROM and a LiveCD of our favorite OS. While using this software to create a bootable USB drive, even beginners should not cause any problems. Just a reminder for fedora you use "sudo yum install unetbootin"; not "sudo apt-get install unetbootin"